Observing, engaging and meditating on John - In the Beginning I am immediately drawn into the boldness of light and colour against the darkness. One is looking into the void and chaos, while at the same time the void is being filled with creation and order is coming into the chaos. There is a beauty and a glory taking shape. I notice three vertical lines. They seem to point to the triune nature of creation, as all of creation and recreation is an act of a triune God. We are invited to see God’s creating work through the foreground image of the triune God, who remains a mystery even in creation. Various other themes seem to be evident: light and darkness; the raw elements of creation: water, fire and wind; lines of separation and integration prevalent in the Genesis account; order and chaos. Perhaps too, one can see the shedding of blood for the forgiveness of sins and the waters of baptism as a witness to the grace and salvation offered by the Word becoming flesh. Makoto Fujimura directs us to explore the first chapter of John’s Gospel by pointing not only to the origin of all creation in Jesus Christ, but also to the mystery of the incarnation of the Word. The Word of God that brings creation matter into being is the same Word made human flesh in the person of Jesus Christ. This creative and incarnate Word reveals the glory, the grace and the truth of God. The invisible God becomes visible. Thus Makoto Fujimura challenges us to take seriously the inter-relationship between the Word and the Image/Icon of God. As the Apostle Paul affirms: ‘Jesus Christ is the Word of God and the Image of the invisible God, the firstborn of all creation’ (Colossians 1:15-20). The one who embodies the truth, goodness and beauty of the Word of God is none other than Jesus Christ. A final theological observation worth noting is that in Genesis 1 God speaks creation into being (creatio ex nihilo), but that at the completion of creation God sees creation and it is good. In his John – In the Beginning Makoto Fujimura bears faithful witness to a fundamental Christian truth, namely that in Christ alone the Word and Image of God exist in perfection. In Christ God speaks creation and salvation into being. It is visible, tangible, touchable, observable. Yet in Christ, the Word Incarnate, God not only speaks the Word of God, but is the Word of God. So at this Christmas we can more deeply appreciate that the One whose birth we celebrate is none other than the creative and incarnate Word of God. He is to be celebrated as the good, true, beautiful, gracious and glorious Word of God, who became flesh and blood and moved into our neighborhood that first Christmas. 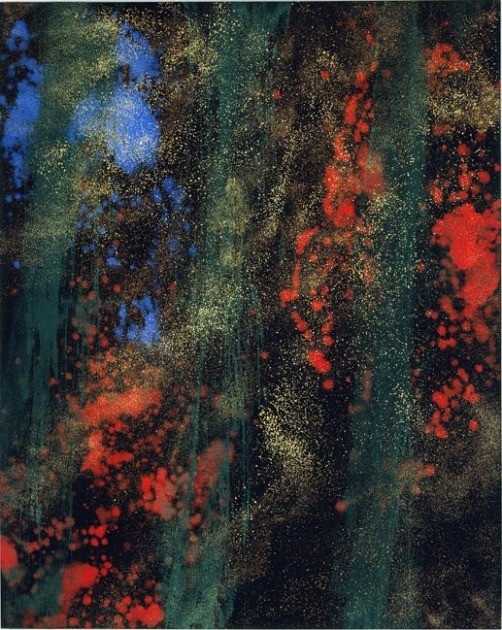 Makoto Fujimura: John – In the Beginning, 120 x 150 cm, mineral pigments, gold on Belgium linen. Bryan Burton is an ordained Minister of Word and Sacrament and Teaching Elder in the Presbyterian Church. He received his PhD from Queen’s University of Belfast, Northern Ireland focusing on the theology of Karl Barth, who had great appreciation for the ability of art to bear witness to Jesus Christ. He is also affiliate professor of theology and ministry at Fuller Theological Seminary and a sessional lecturer at Regent College in Vancouver, BC, Canada. He has long been committed to the integration of theology, worship, ministry, mission and the arts in the church, the academy and culture. His favorite paintings include Matthias Grunewald’s The Crucifixion, Vincent Van Gogh’s The Good Samaritan and Rembrandt’s The Prodigal Son. He is married to Caroline who is from Northern Ireland. The Burtons have two adult children, one of whom is an actor.